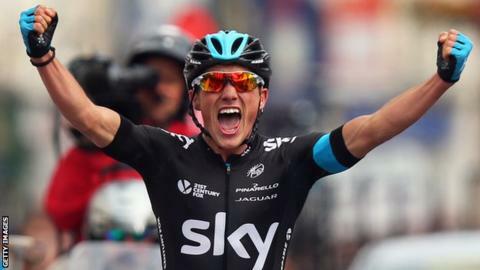 National road race champion Peter Kennaugh will compete in the first professional cycling event on the Isle of Man since 2003. The Onchan rider, 26, will represent Team Sky at the inaugural Manx International Cycling Grand Prix. Co-director Richard Fletcher said it was "fantastic" to have the two-time national champion in a field which also includes Ben Swift and Ed Clancy. The race will take place around the Isle of Man TT course. Last year Kennaugh broke Chris Boardman's 22-year-old record for cycling a lap of the course. Fletcher confirmed more than 140 elite riders will compete in the event designed to showcase the island ahead of a second bid to host the British Cycling National Road Championships. The event, which starts in front of the TT grandstand at 13:25 BST on Sunday, will include both men's and women's races. The three-lap men's race (113 miles) and two-lap women's race (75.5 miles) will form part of the British Cycling National Elite Road Race Series.